Gandermonium: May I have your attention please....Player News! "We have all enjoyed these past five seasons. The Manager has identified that 2 major signings are required to continue improving. Strikers!" 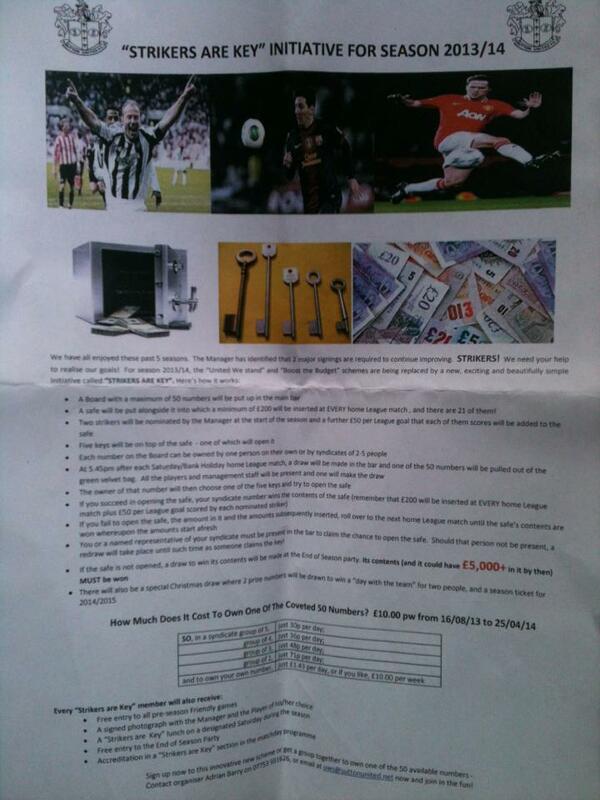 So basically the scheme is this, we put in £40 large into the club on a monthly basis. 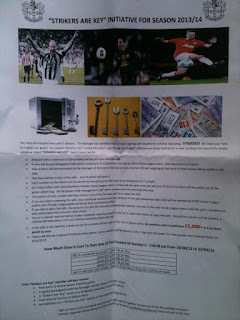 There will be a board of 50 numbers up in the bar ( our syndicate name yet to come to fruitation, but I reckon we'll go with Gandermonium ) A safe will be put along the side the numbers, and a minumum of £200 tokens placed inside the safe at EVERY home league game. Five keys will be placed on top of the safe, but only one will reveal the reddies, if of course your number gets drawn and you get the chance to pick one of the winning keys! If you want some more detailed info on this scheme, then have a look at the pic below! So in a nut shell, thats the scheme! Lets have a look and see what this is bringing us then shall we? Born in Enfield, London,Slabber joined Tottenham Hotspur as a trainee in August 2001, where he was mainly used as a reserve team player. He made just one appearance in the Premier League, coming on as a substitute in the 79th minute for Gary Doherty against Liverpool in a 3–2 defeat on 16 March 2003.He set up Teddy Sheringham for Tottenham's second goal, four minutes from the end. Slabber made the bench on two more occasions, but was never fielded.He had loan spells at Danish outfit AB Copenhagen in 2004, and Swindon Town in 2005. He was released from Spurs in April 2005 and signed for Aldershot Town until the end of the 2004–05 season. Slabber made a total of four appearances, including two in Aldershot's defeat on aggregate in the Conference National play-off semi-finals to Carlisle United, where he scored in the 90th minute of the second-leg. Slabber then signed for Grays Athletic on a free transfer in May 2005, ready for the start of the 2005–06 season. He went on to make 40 Conference National appearances scoring 13 goals over two seasons. In November 2006, he spent a month on loan at Oxford United, making three Conference appearances, but failing to score.Former Grays Athletic manager, Mark Stimson, signed Slabber for Stevenage Borough in December 2006 from Grays. Slabber was released by Stevenage on 17 May 2007, and signed for Conference South club Havant & Waterlooville two months later, ahead of Conference National side Halifax Town. He also had an unsuccessful trial at Rushden & Diamonds in July 2007. He scored his first Havant goal against newly-formed Hayes & Yeading United, a game that Havant won 4–1. He was released from Havant & Waterlooville in October 2008 having made 29 appearances, scoring twice in the Conference South, before re-joining Grays Athletic. On his second debut for Grays, Slabber scored a hat-trick in their 7–0 win at home to Maldon Town in the Essex Senior Cup. Slabber scored the only goal in Grays' 1–0 win over Ebbsfleet United on 26 December 2008, with a header set-up from a pass by Wesley Thomas. His second goal for Grays in the Conference National during the 2008–09 season was in the 2–1 home victory against Altrincham on 7 March 2009, having met Bradley Hudson-Odoi's cross. Slabber scored in Grays' 2–1 victory over Mansfield Town, scoring with a header from a cross supplied by George Beavan. He re-signed for Grays in July, after leaving at the end of the season. 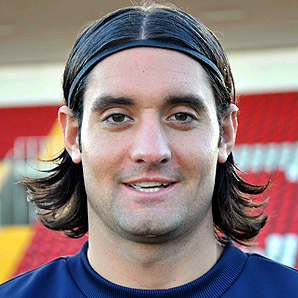 Slabber joined Conference South club Woking on 31 December 2009, signing until the end of the 2009–10 season. At the end of the 2009–10 season he joined Eastleigh, for whom he scored a hat-trick in only his second game (against Dorchester Town). Slabber scored four goals for Eastleigh in a 5–0 Conference South win against Staines Town on his 41st appearance for the club. Slabber won Player's Player and Manager's Player of the Year in the 2010–11 season having made 48 appearances and scoring 25 goals. It was announced on 8th May 2013 that Slabber had joined Sutton United for the 2013-14 season. Born in Crawley, West Sussex, Taylor played for Broadbridge Heath, scoring 17 times during the 2000–01 season, before moving to Horsham at the start of the 2001–02 season. In November 2001 he scored 9 times in three matches, all within 12 days. He moved to Aldershot Town in August 2002. He struggled to establish himself with Aldershot and had a number of loan spells with other clubs, including Horsham in February 2003, and Carshalton Athletic in December 2003,before being released in February 2004. He joined AFC Wimbledon in March 2004, helping them gain promotion to the Isthmian First Division, before returning to Horsham in October the same year. 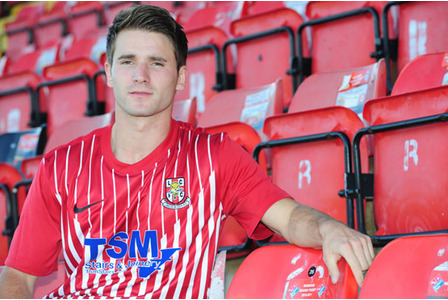 In the 2006, Taylor joined Woking and in March 2007 he joined Dagenham & Redbridge.With Dagenham promoted to the football league at the end of the season, Taylor made his league debut on 18 August 2007 as a second-half substitute for Chris Moore in the 2–2 draw at home to Wycombe Wanderers. On 22 February 2008, Taylor joined Grays Athletic on loan for a month, which was later extended until the end of the 2007–08 season.Taylor scored nine goals in 16 appearances for the Blues, finishing as second top goal scorer to Danny Kedwell. Following his impressive loan spell at Grays Athletic, he was offered a two-year contract at the start of the 2008–09 season. Taylor signed for fellow Conference National outfit Eastbourne Borough on 10 July 2009. He was voted the Supporters & Players' Player of the Year for the 2010–11 season. However, he turned down a new deal with the club following their drop in division. Taylor signed for Lincoln City on a two-year deal on 1 July 2011. After an injury hit first season, Taylor helped the Imps survive in the Blue Square Bet Premier in a difficult 2012-2013 campaign, finishing as top scorer. At the end of his contract, Taylor left to return to his native South Coast. If any more player devlopments happen in the summer, we'll keep you updated! Some of the content in this update has been stolen borrowed from many sources, but mainly Wikipedia! Thats's all from the one they call Juan...for now!